Montreal, Quebec – Targray, a global supplier of advanced materials & solutions for clean technology industries, has been honored with the 2018 Clean50 Award for its contribution to clean capitalism and sustainability in Canada. Andrew Richardson, long-time President of Targray, has accepted the award in the “Renewable Energy” category on behalf of all company employees. 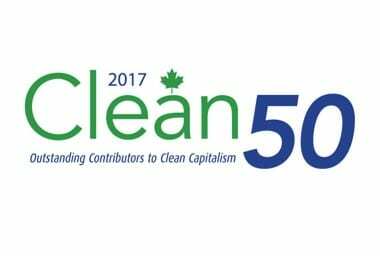 Canada’s Clean50 Awards, announced annually by Delta Management Group and the Clean50 organization, recognize 50 individuals or teams from 16 different categories who have done the most to advance the cause of sustainability and clean capitalism in Canada over the past 2 years. Since 2015, the company has grown to become one of North America’s most important biodiesel companies, while strengthening its position as a leading international supplier to the Solar, Li-ion Battery, and Energy Storage industries. ”Delta’s criteria in determining Honourees is to carefully consider actual measurable accomplishments, demonstrated innovation, collaboration with other organizations, and the power of the Honouree’s contribution to inspire other Canadians to take similar action”. Explained Gavin Pitchford, CEO of Delta Management Group. “To receive a Clean50 award is truly indicative of both industry and personal leadership in the Renewable Energy category”. Targray is a multinational renewable commodities company with a leading presence in four major markets: Solar Photovoltaics, Lithium-ion Battery, Biofuels, and Optical Media. Drawing on three decades of experience in technology-driven industries, the company provides a comprehensive range of advanced materials & solutions that create value for its customers throughout the cleantech supply chain.